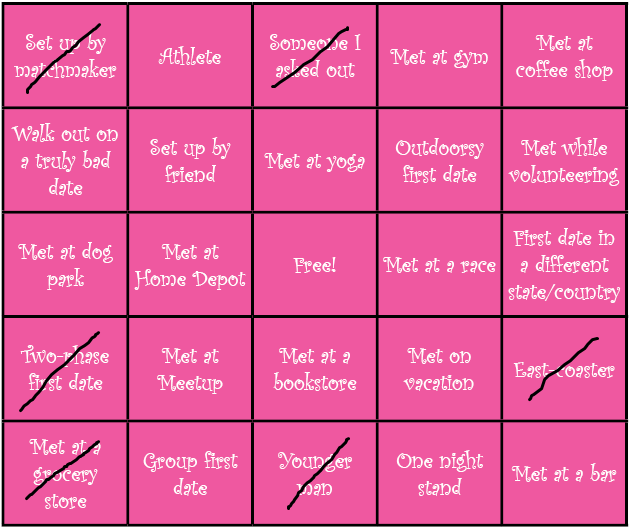 To get out of a dating funk, I made a dating bucket list of sorts – types of guys to date, things to do on dates, where to meet me – and put it in BINGO format. This is my most up-to-date playing card and the posts I’ve written about checking the squares off! signed up with a matchmaker and went out with one of her clients. went out with an East Coaster. met a man at a grocery store. And went on a more-than two-phase date with him. went on a date with a younger man and got asked if he was my son.